A version of this article first appeared in the Japanese magazine, Flyfisher. June is a time of rebirth in Yellowstone. Winter’s icy grip has past, and the only snow remaining is relegated to the high peaks. Fresh green grasses carpet meadows warmed by long summer days. Newborn bison and elk frolic now, exploring their world in the boundless energy of youth. The rivers are experiencing a rebirth, too. Among other goings-on, their seasonal procession of fly hatches is underway. 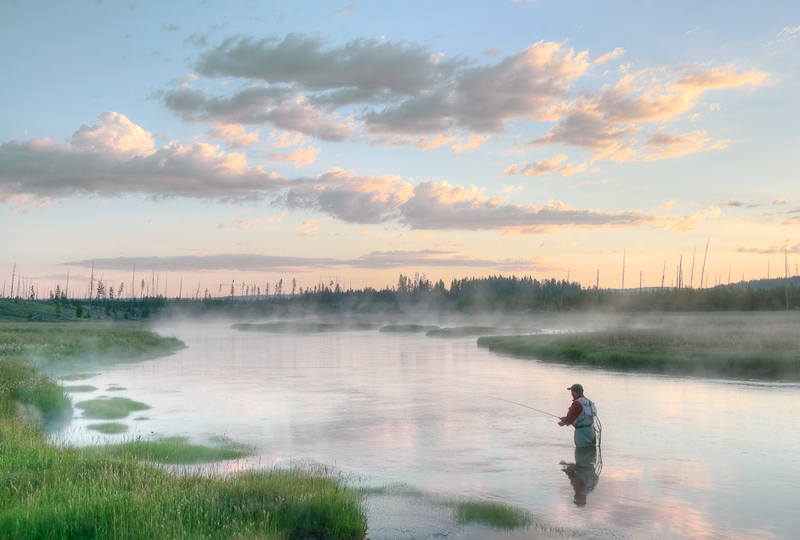 On the Firehole River, June is Pale Morning Dun time. This elegant mayfly is the first large insect of the year to emerge, and it will be the most plentiful mayfly throughout the month. Though Pale Morning Duns begin emerging in May, it’s not until June that their hatches peak. The river’s rainbow and brown trout relish all stages of this insect—nymph, dun, and spinner—and seize every opportunity to feed on them. Prior to June, small Baetis mayflies and the odd Brachycentrus caddis are the main surface foods, so steady numbers of Pale Morning Duns seem especially welcome to the fish. The Firehole is unique among trout streams, flowing as it does through geyser basins, meadows, and lodgepole pine forests. It’s a strange landscape, where an angler can watch trout rising right next to plumes of hot water entering the river from a myriad of thermal springs. The combination of boiling geyser water and cold flows from snowmelt makes for an unusual temperature regime. Water temperatures in June can differ by over 20 degrees Fahrenheit from one stretch of river to another. This has repercussions for the river’s insect life; population densities and emergence schedules of any given fly vary greatly from stretch to stretch. 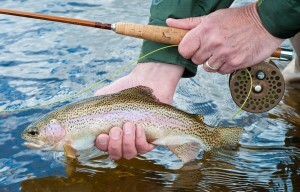 June weather plays an important role in the activity of the trout. Experienced anglers pay close attention to daily conditions for clues as to when the best insect activity (and therefore the best fish activity) will occur. A warm, sunny morning might find Pale Morning Dun spinners on the water by 8:00 a.m., followed by an emergence between 10:00 a.m. and 12:00 p.m. Conversely, cold, rainy, or snowy days (snow is possible anytime in June) might see zero activity until 2:00 p.m. or later, at which point massive emergences of Pale Morning Duns are common. I cast Sparkle Duns to cooperative rainbows rising in riffles and mid-river runs, all the while keeping a watchful eye for secretive browns feeding along undercut, grassy banks. These browns are sly and guarded, offering real challenges to anglers that seek difficulty in their fishing. Regardless of how you take your fishing, it’s all most enjoyable. When the hatch ends and the fish have gone down I often find myself wishing for more. I’m not sure if this is because the season is yet so young, or if it’s simply the entrancing nature of the Firehole itself. Deep down I suspect it’s the river, for it casts a potent spell indeed. So be warned: Once you experience the charms of the Firehole and its Pale Morning Duns, it’s quite likely you’ll never be the same again.